There is a lot you can do with a slow shutter speed, but one of the most common uses for a slow shutter speed in landscape photography is to smooth out moving water. 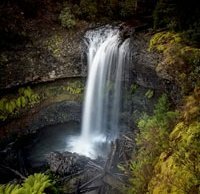 In the video below, photographer Andrew Marr heads to Tarraleah Falls in Australia for midday landscape photography. The waterfall presented numerous challenges. There was a fence which limited composition options and the light was quite bright. Marr likes to start with his Nikon D850 camera set to ISO 64, which is its native base ISO, and his lens at f/8. However, given the lighting situation, this was resulting in a 1/15s shutter speed, which is a bit too fast. Marr aims for around a half-second exposure when shooting waterfalls. His polarizing filter, which is essential for photographing water in order to reduce glare and reflections, helped to slow the exposure down some, but he ended up needing a 6-stop neutral density filter. To view more of Andrew Marr's work and learn about his workshops, click here. For additional videos, click here.